News – Tagged "kids wayfarer"
 Free Home Try On Kits!  Trucker hat, shoes, shirts & GIFT SETS!  FAQs: FREE at home frame try on! Free Home Try On Kits! Trucker hat, shoes, shirts & GIFT SETS! FAQs: FREE at home frame try on! LITTLE PEOPLE DESERVE BIG PEOPLE SHADES. We Tried Out for Shark Tank! See How it Went! So, we stumbled across a Shark Tank open casting call in Las Vegas right after the new year. We live/work in San Diego, so Vegas is only about a 5 hour drive. It felt like fate. We have made a ton of strides as a business in the last couple years, but we have a LONG way to go to be the leader in kids eye wear we want to be. I thought a Shark could help, and worst case scenario, I'd have a fun experience to blog about! Check out the quick video of how it went when I went to Vegas to audition our fun sunglasses for Shark Tank! While I obviously could not film myself pitching our awesome sunglasses, like these white and teal baby sunglasses, to the producers, I included the rough text of my 1 minute pitch below so you can picture it. Hope you find it interesting, it was really fun to do! We won't know how we did for a long time, so now we just sit and wait! Hi, I’m Scott, founder of Roshambo Baby. I am seeking a $X investment for X% of my company. Here’s the simple problem we solved: 50% of the lifetime UV damage done to your eyes occurs before the age of 10 years old. Despite that, the kids eyewear industry is full of cheap, breakable, frankly, ugly stuff largely made in China. It made me and my wife sad. We solved that by going to Italy and creating a line of matching baby, kids' and adult unbreakable sunglasses that can do this. [SHOW OFF HOW FLEXIBLE AND AWESOME THEY ARE!] Full damage and lens replacement guarantee, so light they float, certified safe for baby, BPA free, lead free, all that stuff. You can drive over these in your car and chances are they’ll be fine. Trust me, we’ve done it. But that’s not the only reason I am here. The reason I have like permanent jazz hands about the unlocked potential of my company is because while our frames can also do this, they can also do this [PULL OUT A PAIR OF SHADES WITH A PRESCRIPTION LENS IN THEM!].... all of our frames are prescription friendly and kids can swap out their prescription lens for a new frame color every day if they want to! There is nothing quite like our product on the optometry market. We launched an affordable prescription fulfillment service on our website last year to rave reviews from parents. We are at the tip of an iceberg. Think Warby Parker for kids. We are poised to take this innovative product to a wider audience. I want to be the market leader in children's eyewear because Little People Deserve Big People Shades. But I need a shark to get there. Parenting is a delicate balance of knowing how to raise your kids with integrity while also preparing them for the real world. Sometimes this means doing things that seem counter-intuitive to make sure our kids are actually hearing what we are saying and learning from situations. Something that I learned from teaching and in the first couple of years of parenthood is that opportunities to talk to children without saying no is so important. Now as a mother of two, parenting without saying no, don’t, and stop is an important part of my every single day. Sometimes it’s hard to admit that hearing no is really tough. And in a very real sense, I by no means want my children to grow up without having ever been told no and my kids still hear no on a daily basis. It is absolutely part of life and one I want them to hear. However, I have drastically cut down on its use in our home by saying no without actually using the word. And in cutting down, it has made use of the word more effective for us. 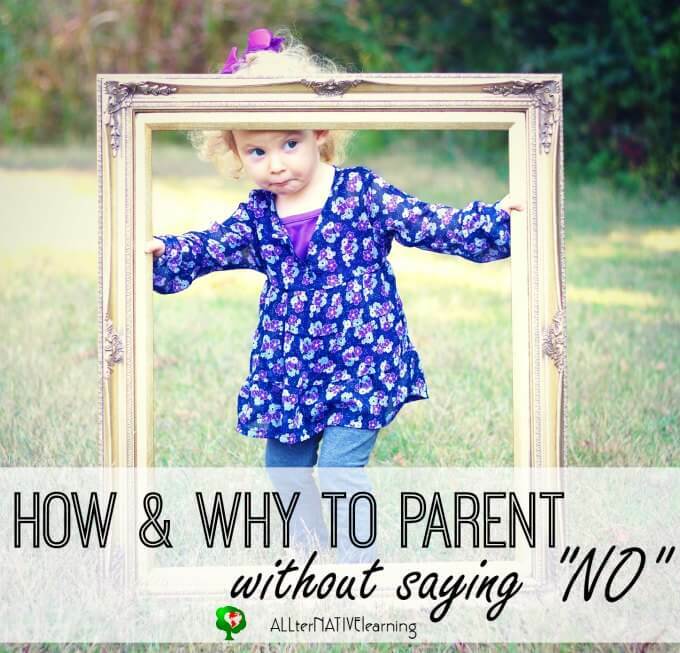 So why would I advocate for adopting the “parenting without saying no” approach? Very simply… because they listen better. The way we are hard wired as humans is to listen to the sentence structure. We sometimes hear the first part of a sentence, almost always hear the last part, but rarely hear the middle unless we have our complete attention on the person talking to us. And really, what young child is giving us their undivided attention at all times? Beyond just the way we hear, it’s also important for all of us to have clear directions. If we are given vague instructions, it leaves a lot of gray area. This is because there are a thousand alternatives to “not” doing something, but only one course of action that should be done when told specifically what to do. So why would we not want to stop saying no to kids and adopt a system that helps our children listen to us better? Or be more obedient? Read about and listen to my podcast episode on the power of saying MAYBE. 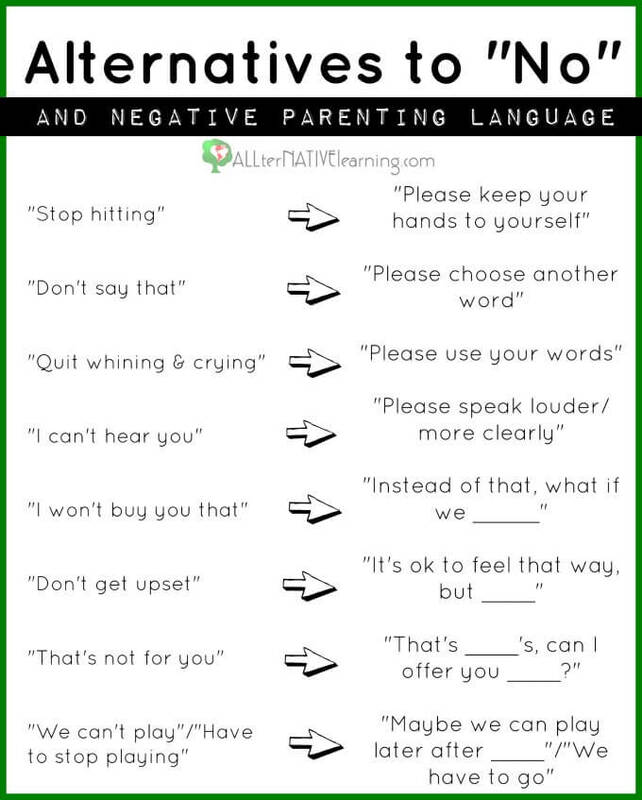 So how do I remove negative words when talking to my child? It’s really easy to say no… WAY too easy. So it’s not going to be a cake walk to retrain your mind to ditch negative words and actions like “no”, “stop”, “don’t”, “can’t”, etc. but it is possible. It took me a long time and I am still not perfect. It’s all about practice. Instead of saying “I can’t talk right now” when I am waiting on hold on the phone and my daughter comes to ask me a question, I say “I am on the phone right now. I can talk to you in a little bit”. I do this because I am focusing on what she is going to hear. If she is not giving me her undivided attention, she may only hear “talk right now”. Instead, I want her to hear “on the phone” and “in a little bit”. Related: Need help navigating your child’s behaviors? There are numerous examples I could give, but thought some of the best were in the image above. We have also replace “don’t touch” with “please keep your hands to yourself”/”please keep your hands in your pockets” (we go to antique stores a lot). And my husband is working on not using “my ears don’t hear whining” because she has shut down too many times. Instead, we encourage her to use her words and express her emotions in a way that we can understand. Read more from Parents with Confidence about adapting your parenting style to your child’s needs. 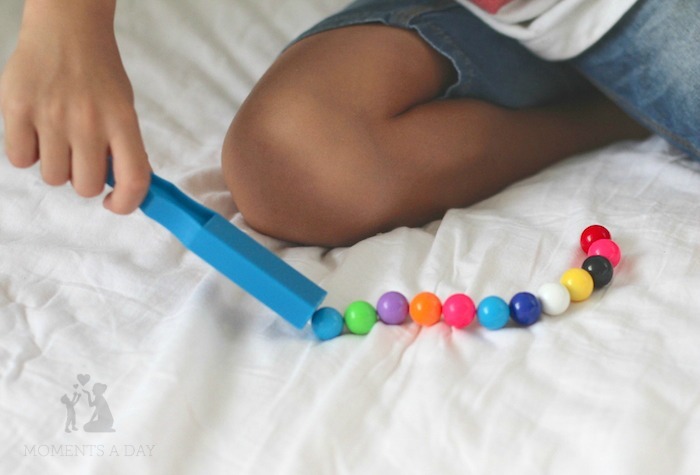 Is it possible to discipline without saying no? Yes! This has everything to do with the idea of being intentional with our words and giving clear instructions to our children. Using positive phrasing actually has the ability to set clearer boundaries than the word no itself. In the end my parenting has become much more intentional by using negative language and “no” less and coming up with a more positive approach. It makes the power of “no” retain its meaning and has created clear boundaries for my children. Need help reframing how you see or respond to situations with your kids? This cheat sheet will help you through some of those tough moments when you want to react with frustration instead of love. The sneak peek is below, but be sure to subscribe to download the full, printable version! 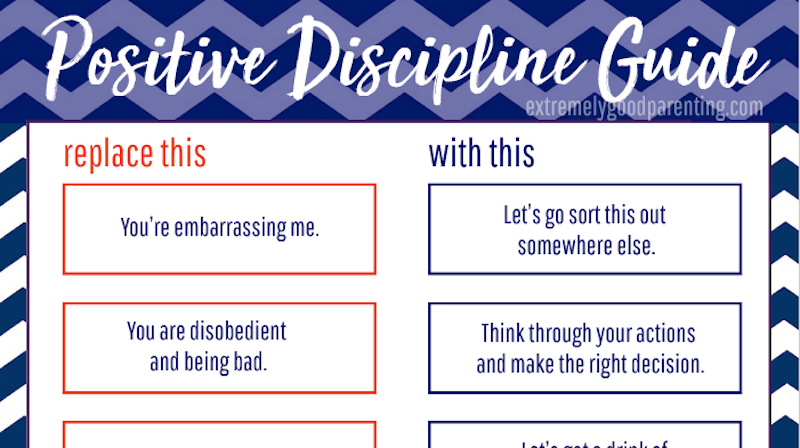 YES, PLEASE SEND ME THE FREE CHEAT SHEET & OTHER PARENTING PRINTABLES! Watch this response to many of your questions & concerns about reducing negative parenting language. The list provided is simply a visual to help say no less. In fact, that is the thesis of my article. In no way have we ditched the word “no” forever. It’s all about finding alternatives and choices, especially in the hard moments as a parent when nothing is working. Also, the phrasing of “negative language” and “positive language” simply refers to the grammatical English term in that the sentence is or is not negative. For more responses, such as one to the “we will not buy that” alternative, please watch the video. It explains how we say no, divert attention, and create boundaries with our words. Thank you all for your great feedback and responses! You are a living magnet. What you attract into your life is in harmony with your dominant thoughts. We used this marble wand to demonstrate and explore the concept behind the quotation above. When we surround ourselves with positive experiences, positive people and positive influences then we can be sure to have a more positive mindset. What makes you happy? Why? Who are your best friends? How do they make you feel? What is your favourite activity? How does it feel when you do it? Where do you enjoy spending time? Why? When you feel happy, how does it influence your actions towards others? What can you do to ensure a positive attitude every day? If you wake up and think, “This is going to be a great day!” what do you think will happen? How about if you think, “This is going to be a bad day”? 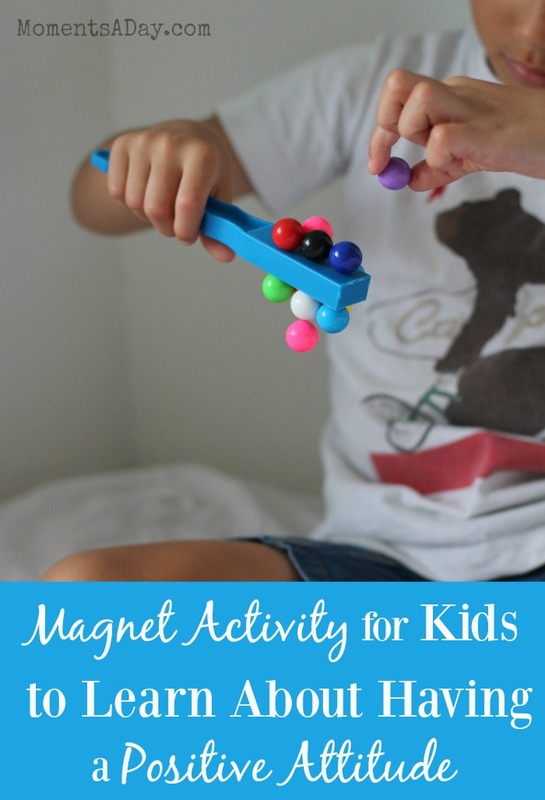 Magnets, of course, can be used for many fun educational activities. Please note that they should always be used under adult supervision. You may also like to check out this post with 10 more activities about developing a positive attitude. 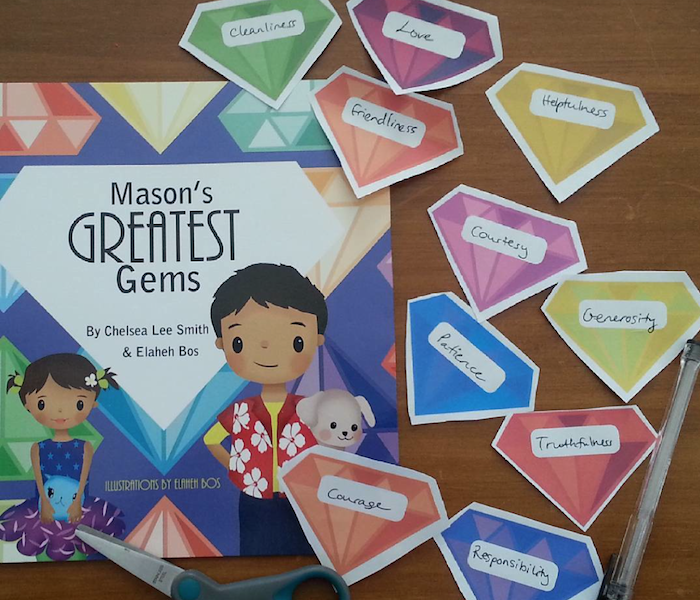 Thanks to Child.com.au for sponsoring this post as well as 10 readings of my storybook Mason’s Greatest Gems. The book shares how to “mine your inner gems” and develop virtues. Character building activities such the one described in this post are a great follow-up to the story. Child.com.au has donated each institution I visit a $100 gift voucher to use on educational materials from their extensive range. I recently enjoyed visiting a primary school in Mount Isa (outback Queensland) to do a reading. This visit was especially fun because the kids knew all about mining as their town had a huge mine in it! After the book reading, I asked the children to name the virtue from the scenarios on the free printable found here and the child who answered correctly got to stand up in front of the group holding the gemstones I had prepared (pictured above). After all the gems on the worksheet had been covered, we went through the virtues again by asking for new examples (and the students then sat down as their virtue had a new example described). One shift in thinking has drastically improved my parenting, and that is moving from a fixed mindset to a growth mindset about being a mom. This growth mindset says – you are always learning and it’s never too late to make a more positive choice. When you make a mistake it’s not an indication that you are doomed to be a failure; it’s an opportunity to grow. The concept is easy enough to understand, but changing the thinking habits I had wasn’t as simple. 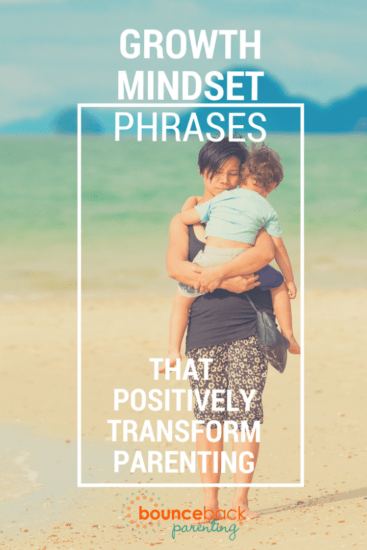 One of the interesting things about growth mindset that Carol Dweck states in her book, Mindset: The New Psychology of Success, is that we can have a growth mindset about one area of life, but not another – that’s how I was about parenting. I had a growth mindset about things like creativity and academic learning. However, when it came to parenting, I expected myself to be a natural at being a mom. I felt so awful about making mistakes in parenting. I’d feel so terribly guilty that I could barely make room for more positive, growth oriented thoughts. However, over time I discovered certain phrases that would quiet down the negative judgmental inner voice and allow me to learn instead of getting stuck in a place of depression and hopelessness. Here is a collection of 10 helpful tips about the growth mindset for parents. If you’d like to be reminded regularly of ways to have a growth mindset, connect with your kids and communicate effectively, make sure you sign up here to get an invite to Bounceback Texts. Always learning – short and simple, you can think about this phrase to remind yourself that it’s healthy to be in the process of learning, you don’t have to know everything. Connection, not perfection – this is my personal favorite growth mindset phrase for remembering the priority in my relationships is connection, not getting every detail perfect. It is useful to think when I find myself getting stressed about a family event not going as planned, when I want to support a friend and don’t quite know the right words, or when I find myself waiting for just the right time to talk or play with my kids. Connection, not perfectionnudges me towards what matters most. I’m in tune with my kids and I can make adjustments to our routines when needed. Have you ever felt like a failure when your perfectly worked out routine falls to pieces? It’s helpful to remember that your job is actually paying attention to this and making a change. It takes strength and wisdom to recognize you need to change course, and then take action to make that change. I made a mistake and I am a big enough person to learn from it and move forward instead of clinging to something that isn’t working. Sometimes it stings to admit we were wrong, but compounding a mistake by clinging to something that isn’t working for you isn’t the answer. Learning from it and moving on is freeing. It’s never too late to make a more positive choice. Sometimes I’ve been caught up thinking that everything is a mess – why bother? This phrase reminds me that making a more positive choice is always an option. I can change directions. I can start over from now. Some days we need a do-over. Permission granted. You can start over from now. I am a work in progress and this is part of that progress. It’s great to have a vision of where you want to be, but sometimes it’s easy to forget that the process of learning and growing has great value. You are someone valuable right now. I always have potential for growth. Yes you do – you are not too old, too broken, too dumb. You have potential for growth. It’s helpful for me to remember I am not stuck being one particular way; through effort and time I can change if I wish. What have I learned from this? Reflecting on what you’ve learned, even from the most uncomfortable situations, helps you grow. What phrase do you like to say to yourself to help you remember that you don’t have to be perfect? If you need the perfect companion piece to one of these 16 cute baby onesies, Ro·Sham·Bo Baby eyewear has your back! If you can't get enough of the serious baby style* that graces your Instagram feed, we're totally with you. 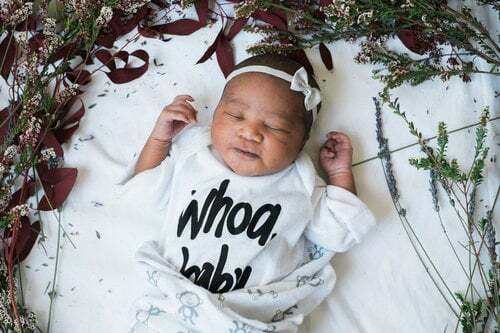 There are a ton of small businesses that make the most precious onesies for babies, which in turn make photos of babies that much more adorable (bet you didn't think that was possible!). 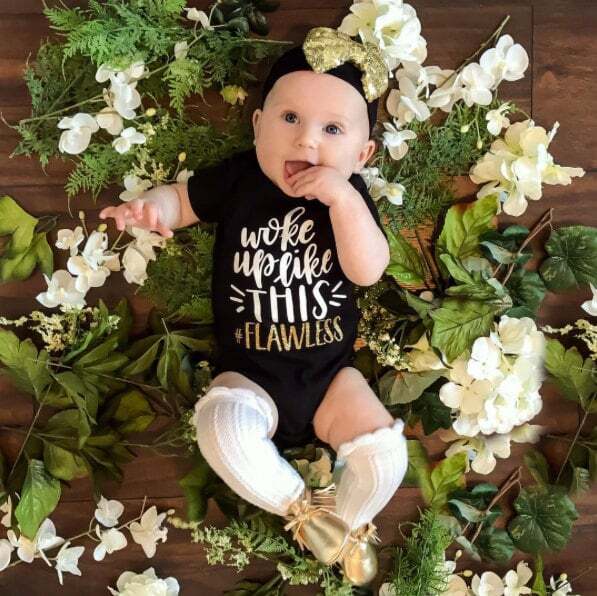 We're sharing some of those onesies with you so that your photos can be the ones to pop up on other peoples' feeds to make them say, "Damn, that's a cute baby in a cute onesie." 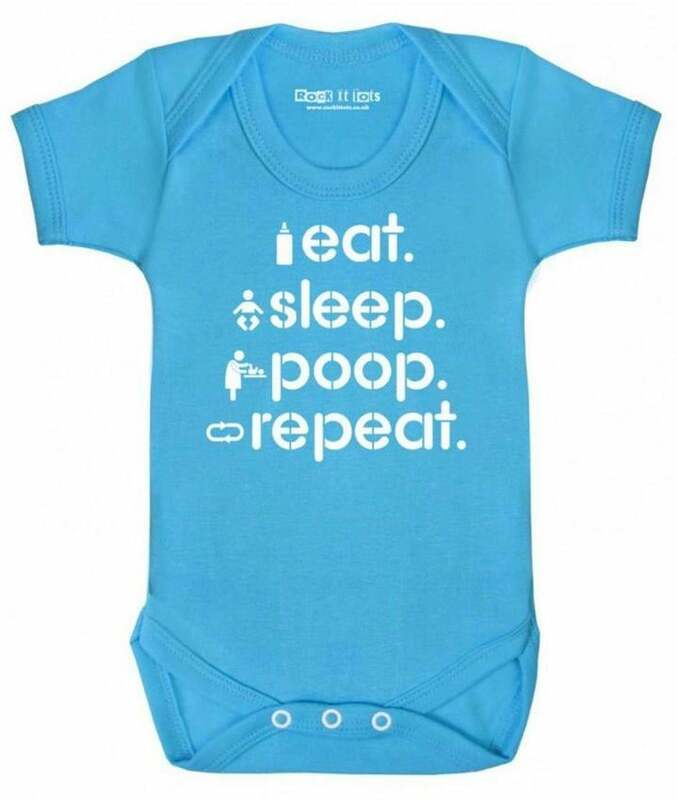 Scroll through for fun onesies that you'll want your little babe to be wearing during their next iPhone photo shoot. *Don't forget about mama Instagram style! Shout it like you mean it when you put your little bundle in this Hello . 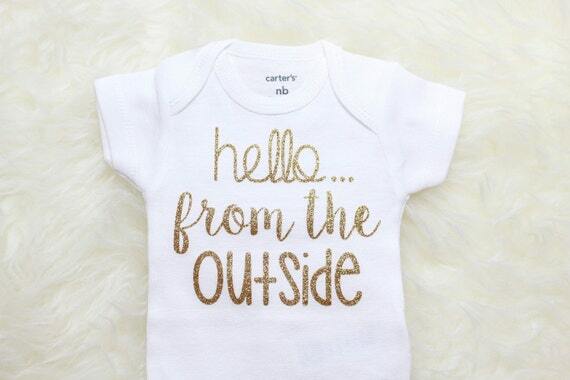 . . From the Outside Onesie ($14, originally $16). Keep the mood light and fun when you put your little bundle in the Feather 4 Arrow Keep Rad One Piece ($24). If you love SoCal then get your ray of sunshine this appropriate Orange Heat Organic La Sunshine Onesie ($32). 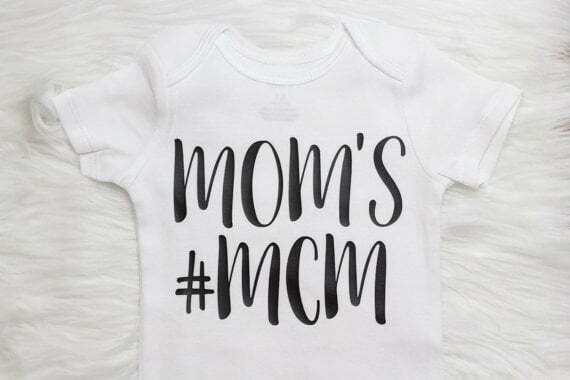 Put your little boy in this confidence-boosting Mom's #MCM Onesie ($13, originally $16). 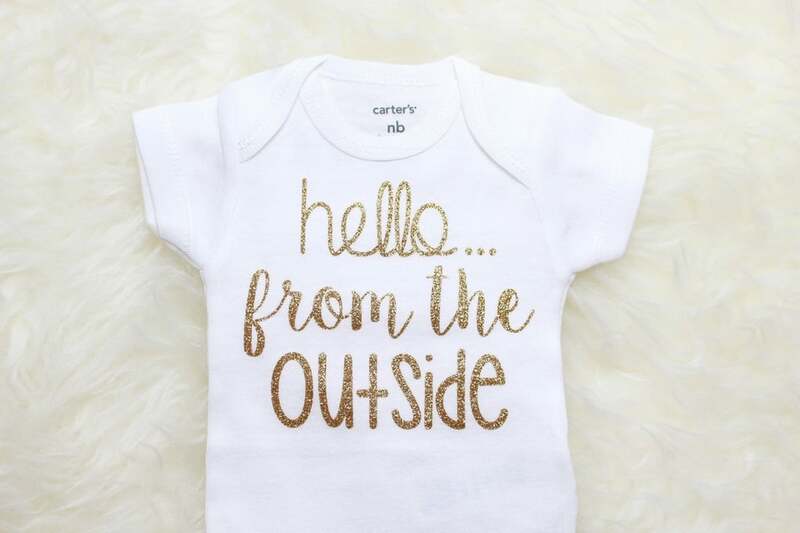 We challenge you to put your phone away when you see your newborn in this Whoa, Baby Onesie ($22). Hope to have a jet-setting wee one? 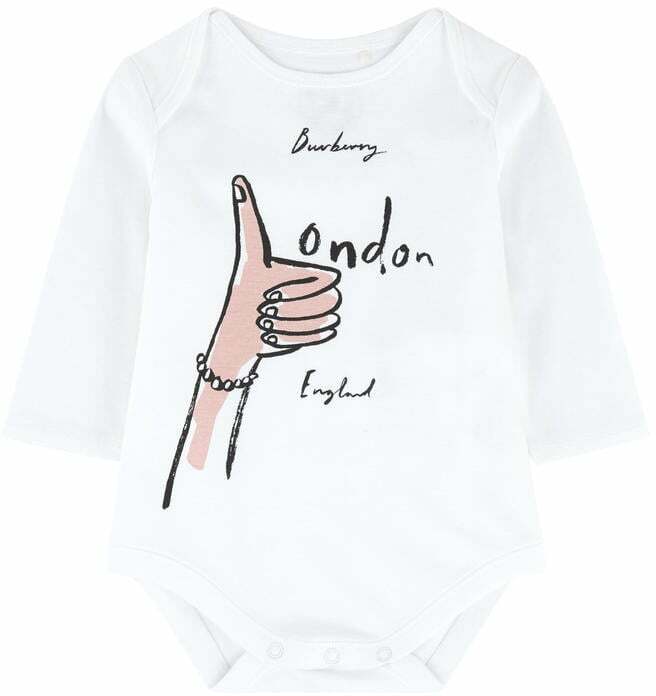 Then get them the Burberry Graphic onesies ($138). 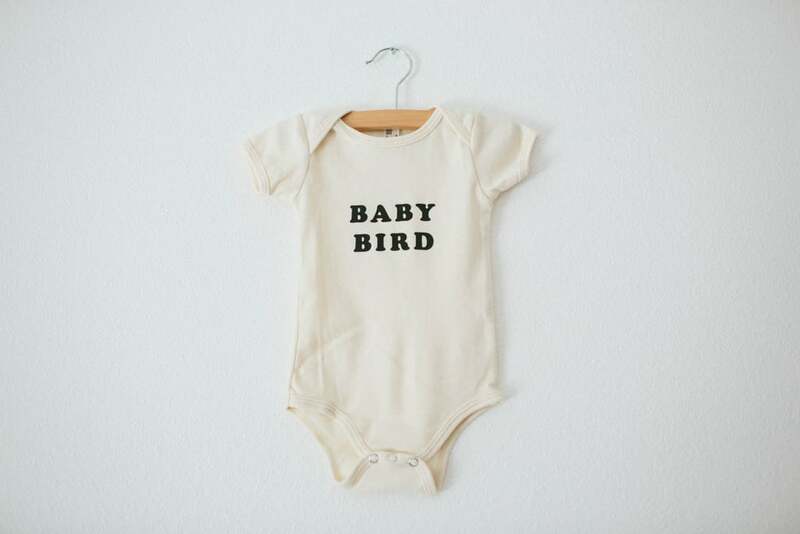 The simple Baby Bird ($28) onesie is 100% organic. 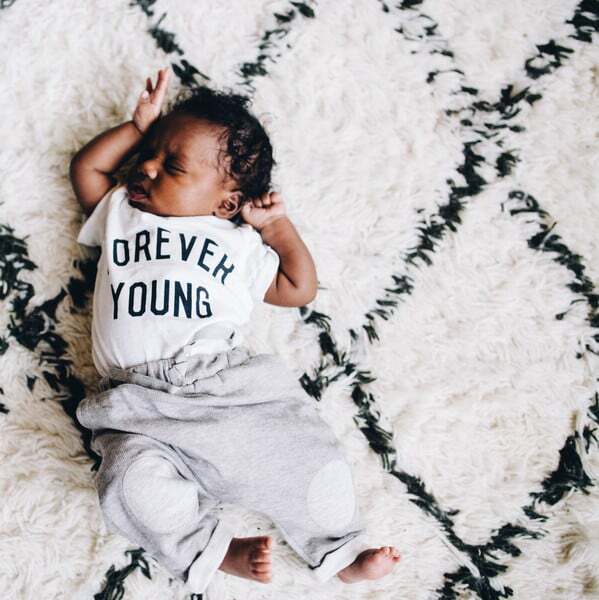 The Forever Young Onesie ($38) will make you wish this were actually true. 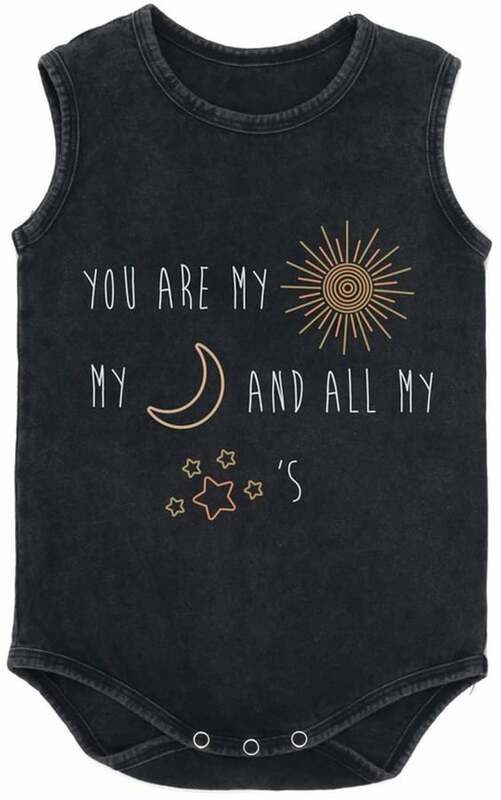 Tell them how much you love them when you put them in the Children of the Tribe Sol Luna Onesie ($39). 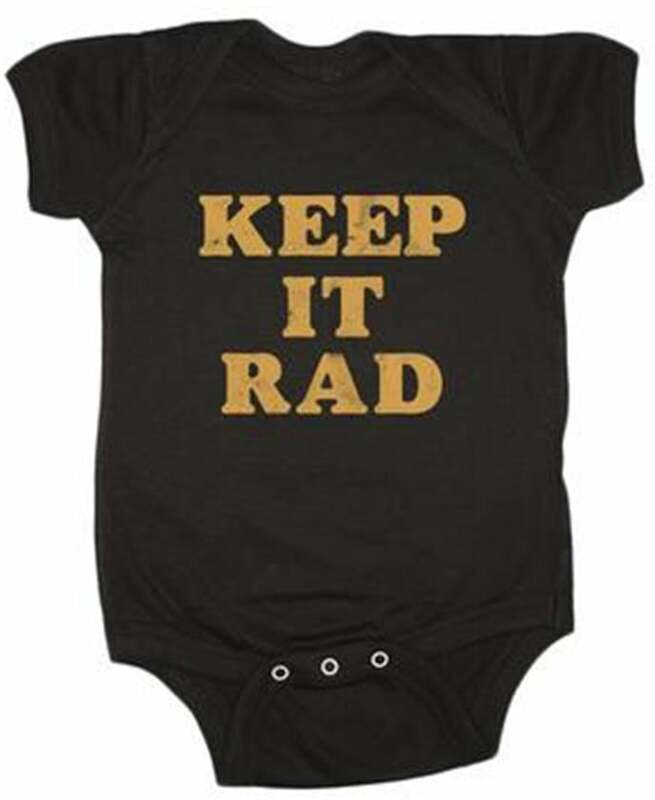 Show them who the real flirt in the family is when he or she wears the Funny Baby Onesie($15). 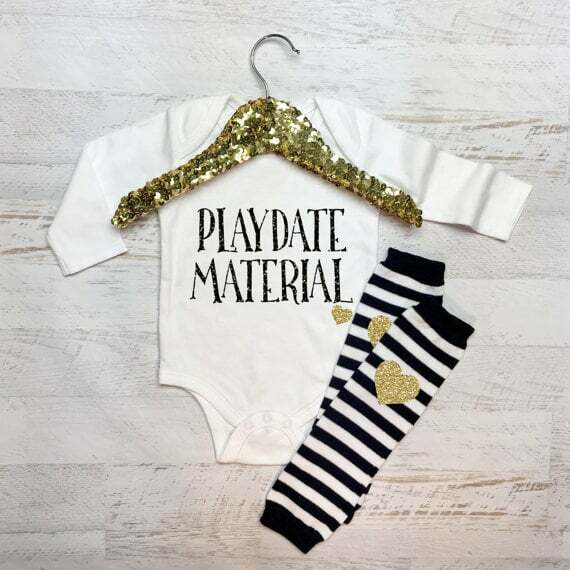 Nothing is more true than the words on the Pink Poodle Boutique Eat Sleep Onesie ($49). 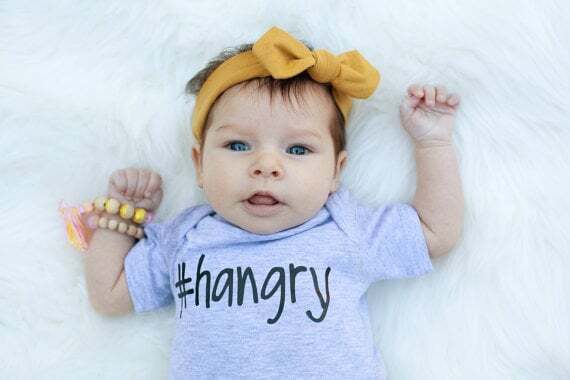 Everyone will know exactly what your kid is feeling when they wear the #Hangry Onesie ($18). 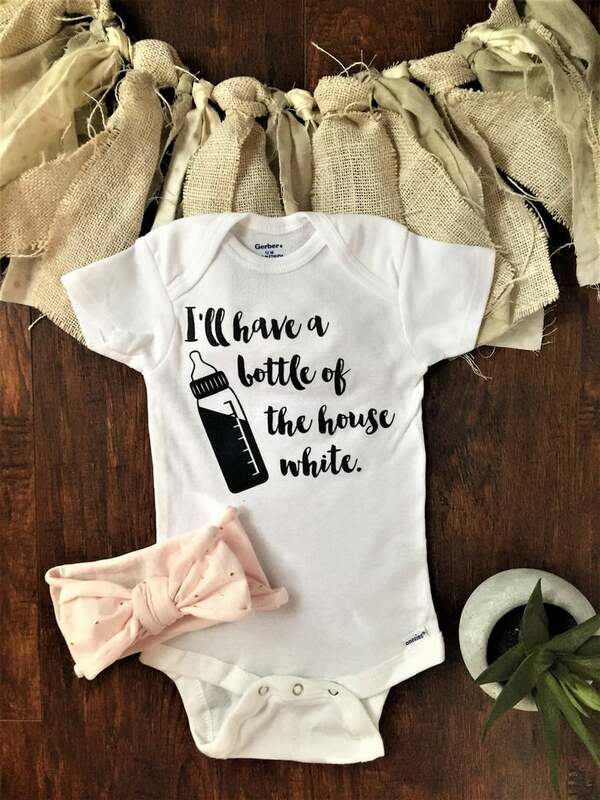 Anyone with a sense of humor will get a kick out of this House White Onesie ($13). 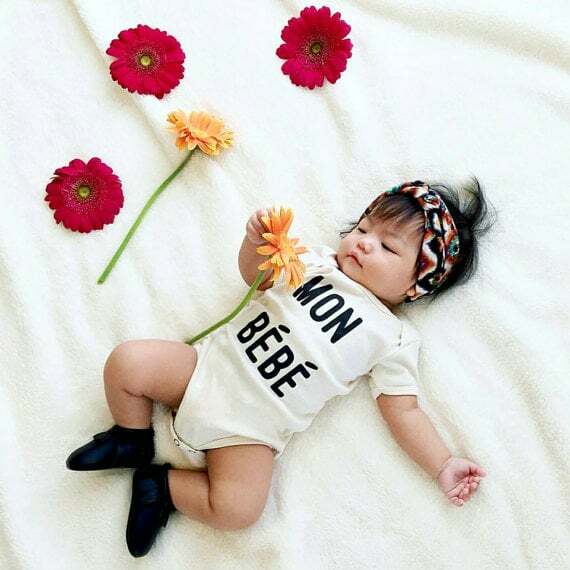 There's nothing quite as precious as this Mon Bébé Onesie ($24). 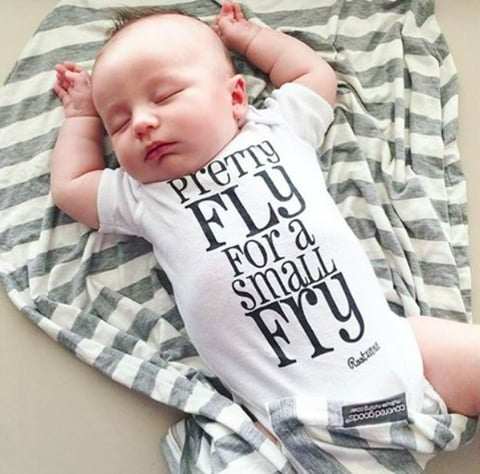 Hard to disagree with the Pretty Fly For a Small Fry Onesie ($20). The dog days of Summer may be well behind us, but that doesn't mean it's time to pack in the outdoor adventures quite yet. Crisp Fall days are just around the corner they lend themselves perfectly to throwing on a sweater and embarking on family fun from sun up till sundown. Here, 22 ways to take advantage of the season!
. . . and jump in them! One bucket of sidewalk chalk will lend itself to hours of entertainment and tons of learning opportunities. All you need is a concrete space, a wild imagination, and a hose for cleanup. Try these five ideas to start with. If your kids have been begging for a pet of their own for months and you're simply unable to oblige, give them the next best thing. Grab some stale bread to use as duck food, and head to your nearest lake or pond. You can even make a half-day trip of it, packing a lunch and hanging by the playground. Seek out a nearby orchard and get picking! This will also solve your dilemma of what to do on upcoming rainy or overcast days, as your bushels of apples will make the most delicious pies, muffins, breads, and more. Teach the kids about setting goals early on with a Fall bucket list. It doesn't have to be anything serious — think friendships, new sports, and recipes — but it will be fun to turn to your list for ideas next time you hear a chorus of "Mom, I'm bored . . . "
Switch up their usual sidewalk chalk play a bit and let them spray their artwork instead. By mixing paint, water, cornstarch, and soap, they'll have a unique formula that's fun to spritz on the driveway and sidewalk. The whole family will get a healthy dose of exercise by exploring a local park or new neighborhood on a kid-friendly hike. Sensory boxes are a fun way to get kids talking about what they're seeing and feeling. This garden sensory bin is a great way to wrap a theme around the bin. Turn the kids into their favorite animals with face paint, glitter, and jewels. Don't worry if you're not a professional makeup artist, we have all the tips and tricks you need to know! Carving a jack-o'-lantern is so much more satisfying when he's made from a pumpkin that your kids picked on their very own. Avoid the mess of making ice cream inside with this fun and toddler-friendly activity. Simply mix the ingredients and then have the kids roll the can back and forth! Some of the best Indian Summer memories can be made around a campfire. If you have a fire pit or access to one, let the kids roast everything from veggies to s'mores. After everyone is fed and full, tell stories and share some laughs. Pull out the pirate hats and send your littlest mateys off on search of buried treasure. Make a map leading them to the bounty by staining paper with coffee and burning the edges. Then, have a prize — like gold coins — hidden at the end of the journey. Watching their excitement will be just as much fun for you as it is for them. Get the kids into a competitive spirit with an obstacle course. Using objects you already own (ropes, tubes, and beams), you can create a backyard course that tests their agility and will keep them entertained for hours. It also makes an affordable party theme! Follow Ralph Waldo Emerson's sage advice: "Life is a journey, not a destination," and take a meandering drive down a scenic stretch near your home — simply to soak in the beauty of the changing leaves. Not sure where to start? Check out The Weather Channel's guide to the best scenic drives in the country. No need to wait until Christmas — bake up a batch of chewy sugar cookies and let your kids go to town with some al fresco frosting and decorating fun. Use cookie cutters, food coloring, and sprinkles to make each cookie unique. Starting a garden is a great way to teach your kids about the value of fresh food, and inspire them to take an interest in the culinary arts later on. Between the watering and the weeding, a garden will give them an ongoing project that'll also be a fun and hands-on way to teach responsibility. Pack for a picnic and head to the park; it's time for an adventure! Bring along your family's favorite on-the-go eats and these picnic essentials for an afternoon of fun under the early Fall sun. Get out the spray bottles: this artistic project may get a little messy, but when it's executed outdoors, cleanup's a breeze. Put your little detectives to work with a scavenger hunt. This is a great activity for a group of kids, and you can set it up anywhere: a park, your backyard, or around the neighborhood. Keep it simple or turn to this detective party for clues on how to set up a more elaborate adventure. Actually spending the night outdoors may be a bit chilly in Fall, but for an evening of family fun, pitch a tent, make s'mores, and tell campfire stories — then cuddle up in the comfort of your own beds. It's the best of both worlds! Encourage your little shutterbugs to get snapping by creating a list of "photo missions," and accompanying them on a photo safari. Include things you're apt to see around your neighborhood — a red door, a mom with a double stroller, a white dog . . . get creative! And don't forget to wear your ro•sham•bo shades while doing all outdoor activities! The air may be colder, but the sun still shines just as bright in the fall - even brighter when it has snow to bounce off of! Going broke funding your kid's extracurricular activities? Try these 11 tips on how to spend less on after-school extracurricular activities. We don't have to tell you that there are tons of benefits to laving your kids participating in after-school activities. Extracurriculars help a child's physical development, boost social skills, improve academic performance, and build confidence. The only potential downside is the cost. Not to worry: These 11 tips to spend less on your kid's after-school extracurricular activities. Fill out your child's registration paperwork and pay the fees as early as possible. Some organizations give a discount for early registration, and registering early gives you time to prepare for the activity so that you can accommodate it into your budget without last minute surprise expenses, says Clare K. Levison, author of Frugal Isn't Cheap: Spend Less, Save More, and Live Better. Another reason to get your child enrolled early: you don't have to worry about forgetting to do it in time and then having to pay a late registration fee! Some activities offer a multi-child or sibling discount, but you may not get it if you don't ask. Even if you only have one child participating in the program, check if there are any other discounts for which your child or family might qualify. You never know. A program may give a small percentage off if you or your spouse are military or law enforcement, or if your child is on the honor roll at school. "It never hurts to ask for a discount because every little bit helps," Levison says. Yep, you may be able to find a coupon for your child's baseball team or dance class. "Thanks to sites like Groupon and LivingSocial, there are coupons for just about everything now, including extracurricular activities," says Michael Catania, co-founder of the savings community PromotionCode.org. "Do a quick search for the activity along with the month and year (for example, Pony League Baseball, Las Vegas, August 2016 offers) to see if what discounts might be available before you register," he says. It's also a good idea to look for discount codes when shopping for uniforms, equipment and other required items. Even if it's only a 5 percent off or BOGO offer, those savings add up. Volunteering with the organization can often reduce or remove the participation fees for your child, says consumer and money-saving expert Andrea Woroch. "You can offer to help with bookkeeping, coaching, or cleaning a dance studio, or you could offer your professional skills, whether that be marketing or web design," she says. Whatever you do, it doesn't have to be too time-consuming. It could be as simple as running the concession stands once a week. Every little bit helps, so talk to the program coordinators to see if there are ways you can pitch in while also reducing your child's fees. A couple of bonuses: You get to spend more time with your child doing something he enjoys, and depending on the activity, you may even get in a mini-workout. It's frustrating and financially draining when your child asks to participate in something, you fork over the cash, and then she begs to quit a couple of weeks later. If you're not sure that your kid will stick with a particular activity, ask if there's a way to try it out before making a full commitment. Some organizations will let your child to attend a class or two on a trial basis. It may be at no cost, or you may have to pay a small fee. Either way, it will give you and your kid time to see if this is really an activity she wants to be involved in, without you having to pay (and possibly lose) the whole fee. Of course, there are some things that should only be purchased new (such as mouthguards and helmets), but for many other things, secondhand is just as good. Asking family, friends, or neighbors for hand-me-downs is a great way to score gently used items like cleats, uniforms, bats, and art supplies for free or cheap. Buying used can keep more money in your pocketbook too. Check out thrift stores, eBay, Craigslist, yard sales, consignment shops, resellers like Play it Again Sports, or swap sites like SwapMeSports.com. And don't think that buying used means your child will get beat up gear. "A lot of times people try something, decide they don't like it (see above!) and then they have a piece of equipment that's practically brand new that they don't have a use for anymore, so it ends up at a thrift store [or other resale shop]," says Levison. Rather than paying for instruments, which can be expensive, look into renting. You can likely find rental options locally or through an online dealer. Another possibility: your library. "Some libraries, particularly those in big cities, offer rentals of musical instruments with just your library card," Catania says. Since you obviously won't be able to keep a library rental for the full school year, this option is best when your child is undecided about which instrument she wants to play and trying out different options. Once she's found the instrument she likes, you can look into a long-term rental from a music store or online. In addition to the costs of the activity, many families shell out extra cash on food and snacks. Think about it: When you're leaving a long day at work and then heading to this or that practice or game, the last thing you want to do is stand over a hot stove. So you load up on snacks at the concession stand or grab takeout on the way home—and increase your spending. "Usuallly we find we spend too much money when we find ourselves in a time crunch," Levison says. "So if you can plan your meals ahead, do your shopping at the beginning of the week, and plan easy but healthy meals on the nights you have activities, it can save a lot of time and money." Another area that many parents don't factor into their budget with extracurricular activities is the added travel expenses. "Organize carpools with other parents and take turns driving to practices, games, and performances," Woroch says. Since everyone's schedule is likely to be busy, reach out to others to try to create a game plan as early in the season as possible. When it's your turn to drive, make sure you save on gas. "Start off by finding the lowest local prices with an app like Gas Buddy—a crowd-sourced app that offers near up-to-the-minute gas prices sorted by zip code," Catania says. And most gas stations have affiliations with credit cards and grocery stores, so if you carry a card or shop at a specific store, look to see if it can help you lower your fuel expenses. Just because your child participates in an activity doesn't mean he has to have every little item the team offers for sale. "Professional photos, videos, and extra shirts are fun to have, but the costs can really add up," Levison says. So pass on things that aren't necessities. You can take your own photos or videos, and skip the team shirts for mom and dad and show your support by wearing the team colors instead. If your kid wants to do football, soccer and swim, you may have to give him a choice. 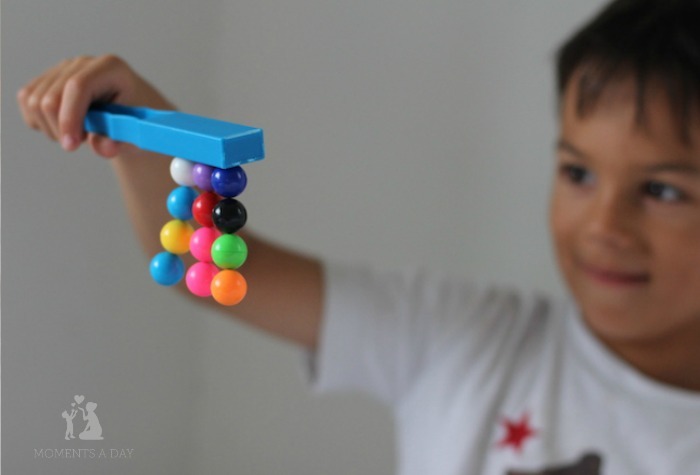 "I think we tend to want to sign our kids up for a lot of organized activities these days, but you don't have to go overboard, especially if it's affecting your finances," Levison says. Limit your child to one activity per season, and tell him to choose the one he wants to do most. If he has an interest in something else, he can do it at home or find a community center that is more affordable than, says, private art lessons. Sure, there may be some whining (or even tears), but you have to do what's right for your financial situation. And, add Levinson, this is a good opportunity to something else that's beneficial to your child: have a conversation about budgets and the cost of activities. With savings like these, you can treat you and your kiddos to rad rosmbo shades! While your kids are out playing, make sure their eyes are safe! Added bonus that our shades are unbreakable. From that unexpected stuffy nose to outdoor conditions that trigger your child's every sniffle, Fall weather can often throw allergies a curve ball. We're sharing our tips to help keep allergies at bay during the Fall season. By arming yourself and your child with allergy relief, you'll be able to focus on the exciting new experiences and activities that make this time of year so festive and fun. Polarized Sunglasses for the Whole Family! We Tried out for Shark Tank... the Update (with video!)! !